I strongly recommend to watch this opening keynote to see the problems we’re trying to solve with the Hooks proposal. However, even an hour is a big time investment, so I decided to share a few thoughts on Hooks below. Note: Hooks are an experimental proposal to React. You don’t need to learn about them right now. Also, note that this post contains my personal opinions and doesn’t necessarily reflect the positions of the React team. Huge components that are hard to refactor and test. Duplicated logic between different components and lifecycle methods. Complex patterns like render props and higher-order components. 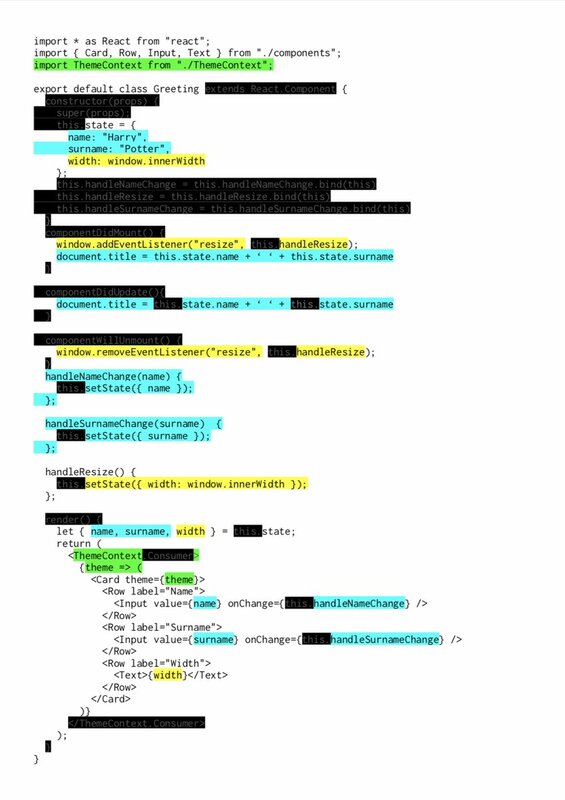 ok so - I took dan's classes/hooks code from react conf, blacked out the 'unnecessary' bits, then colour coded bits by 'concern'. so much nicer. the effect is amplified in more complex components, where concerns are split and mixed across lifecycle methods. Took @dan_abramov's code from #ReactConf2018 and visualised it so you could see the benefits that React Hooks bring us. 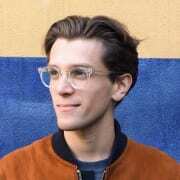 Hooks apply the React philosophy (explicit data flow and composition) inside a component, rather than just between the components. That’s why I feel that Hooks are a natural fit for the React component model. Unlike patterns like render props or higher-order components, Hooks don’t introduce unnecessary nesting into your component tree. They also don’t suffer from the drawbacks of mixins. Even if you have a visceral first reaction (as I did at first! ), I encourage you to give this proposal a fair try and play with it. I think you’ll like it. Before we look at Hooks in detail, you might be worried that we’re just adding more concepts to React with Hooks. That’s a fair criticism. I think that while there is definitely going to be a short-term cognitive cost to learning them, the end result will be the opposite. If the React community embraces the Hooks proposal, it will reduce the number of concepts you need to juggle when writing React applications. 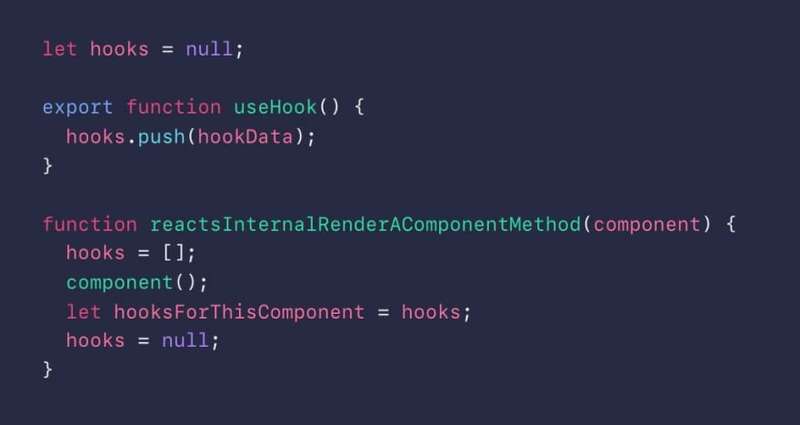 Hooks let you always use functions instead of having to constantly switch between functions, classes, higher-order components, and render props. The Hooks proposal doesn’t include any breaking changes. Your existing code would keep on working even if you adopted Hooks in the newly written components. In fact, that’s exactly what we recommend — don’t do any big rewrites! It’s a good idea to wait with adopting Hooks in any critical code. Still, we’d appreciate if you could experiment with the 16.7 alpha to provide us with feedback on the Hooks proposal and report any bugs. To understand Hooks, we need to take a step back and think about code reuse. Today, there are a lot of ways to reuse logic in React apps. We can write simple functions and call them to calculate something. We can also write components (which themselves could be functions or classes). Components are more powerful, but they have to render some UI. This makes them inconvenient for sharing non-visual logic. This is how we end up with complex patterns like render props and higher-order components. Wouldn’t React be simpler if there was just one common way to reuse code instead of so many? Functions seem to be a perfect mechanism for code reuse. Moving logic between functions takes the least amount of effort. However, functions can’t have local React state inside them. You can’t extract behavior like “watch window size and update the state” or “animate a value over time” from a class component without restructuring your code or introducing an abstraction like Observables. Both approaches hurt the simplicity that we like about React. Hooks solve exactly that problem. Hooks let you use React features (like state) from a function — by doing a single function call. React provides a few built-in Hooks exposing the “building blocks” of React: state, lifecycle, and context. "You can npm install an even greater percentage of your application code than before" is, I think, going to be a significant selling point for Hooks. Note that custom Hooks are not technically a React feature. The possibility of writing your own Hooks naturally follows from the way Hooks are designed. Let’s say we want to subscribe a component to the current window width (for example, to display different content on a narrow viewport). If you read this code, it does exactly what it says. 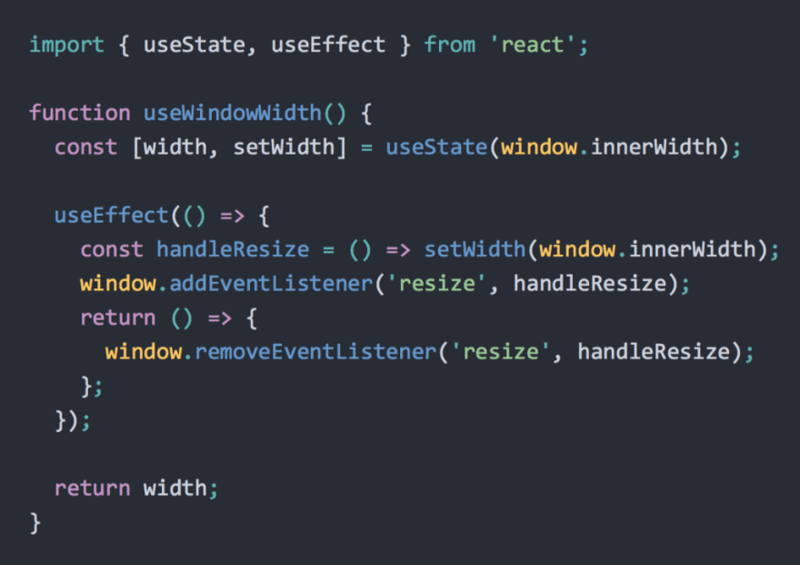 We use the window width in our component, and React re-renders our component if it changes. 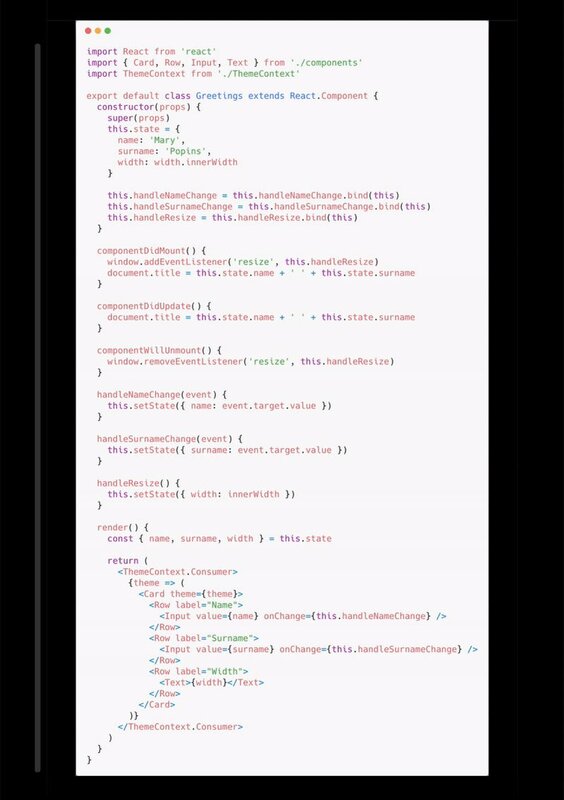 And that’s the goal of Hooks — to make components truly declarative even if they contain state and side effects. As you can see above, the built-in React Hooks like useState and useEffect serve as the basic building blocks. We can use them from our components directly, or we can combine them into custom Hooks like useWindowWidth. Using custom Hooks feels as idiomatic as using React’s built-in API. You can learn more about built-in Hooks from this overview. Hooks are fully encapsulated — each time you call a Hook, it gets isolated local state within the currently executing component. This doesn’t matter for this particular example (window width is the same for all components! ), but it’s what makes Hooks so powerful. They’re not a way to share state — but a way to share stateful logic. We don’t want to break the top-down data flow! Note how in the demo source code, the staggering animation is implemented by passing values through several custom Hooks in the same render function. The ability to pass data between Hooks make them a great fit for expressing animations, data subscriptions, form management, and other stateful abstractions. Unlike render props or higher-order components, Hooks don’t create a “false hierarchy” in your render tree. They’re more like a flat list of “memory cells” attached to a component. No extra layers. Custom Hooks are, in our opinion, the most appealing part of the Hooks proposal. But in order for custom Hooks to work, React needs to provide functions with a way to declare state and side effects. And that’s exactly what built-in Hooks like useState and useEffect let us do. You can learn about them in the documentation. It turns out that these built-in Hooks aren’t only useful for creating custom Hooks. They are also sufficient for defining components in general, as they provide us with all the necessary features like state. This is why we’d like Hooks to become the primary way to define React components in the future. We have no plans to deprecate classes. At Facebook we have tens of thousands of class components and, like you, we have no intention of rewriting them. But if the React community embraces Hooks, it doesn’t make sense to have two different recommended ways to write components. Hooks can cover all use cases for classes while providing more flexibility in extracting, testing, and reusing code. This is why Hooks represent our vision for the future of React. You may have been surprised by the Rules of Hooks. While it’s unusual that Hooks have to be called at the top level, you probably wouldn’t want to define state in a condition even if you could. For example, you can’t define state conditionally in a class either, and over four years of talking to React users I haven’t heard a complaint about this. This design is crucial to enabling custom Hooks without introducing extra syntactic noise or other pitfalls. We recognize the initial unfamiliarity but we think this tradeoff is worth the features it enables. If you disagree, I encourage you to play with it in practice and see if that changes how you feel. We keep a list of Hooks per component, and move to the next item in the list whenever a Hook is used. Thanks to the Rules of Hooks, their order is the same on every render, so we can provide the component with correct state for each call. Don’t forget that React doesn’t need to do anything special to know which component is rendering — React is what’s calling your component. Perhaps you’re wondering where React keeps the state for Hooks. The answer is it’s kept in the exact same place where React keeps state for classes. React has an internal update queue which is the source of truth for any state, no matter how you define your components. Whether you were concerned from a more pragmatic or a dogmatic perspective (if you were at all), I hope that at least one of these justifications makes sense. If you’re curious, Sebastian (the author of the Hooks proposal) also responded to these and other concerns in this comment on the RFC. Most importantly, I think Hooks let us build components with less effort, and create better user experiences. And that’s why I’m personally excited about Hooks. If Hooks still don’t seem compelling to you, I can totally understand it. I still hope that you’ll give them a try on a small pet project and see if that changes your opinion. Whether you haven’t experienced the problems Hooks solve, or if you have a different solution in mind, please let us know in the RFC! If I did get you excited, or at least a little bit curious, that’s great! I have just one favor to ask. 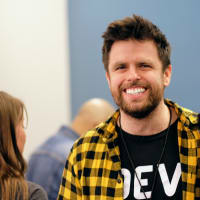 There are many folks who are learning React right now, and they will get confused if we hurry with writing tutorials and declaring best practices for a feature that has barely been out for a few days. There are some things about Hooks that aren’t quite clear yet even to us on the React team. If you create any content about Hooks while they’re unstable, please mention prominently that they are an experimental proposal, and include a link to the official documentation . We’ll keep it up to date with any changes to the proposal. We’ve also spent quite a bit of effort to make it comprehensive, so many questions are already answered there. When you talk to other people who aren’t as excited as you are, please be courteous. If you see a misconception, you can share extra information if the other person is open to it. But any change is scary, and as a community we should try our best to help people instead of alienating them. And if I (or anyone else on the React team) fail to follow this advice, please call us out! Hooks are still in an early stage, but we’re excited to hear feedback from all of you. You can direct it to the RFC, but we’ll also do our best to keep up with the conversations on Twitter. Please let me know if something isn’t clear, and I’d be happy to chat about your concerns. Thank you for reading! If the React community embraces the Hooks proposal, it will reduce the number of concepts you need to juggle when writing React applications. As a fairly recent React user, I think this is probably the biggest selling point for me. Have a good feeling that Hooks will make things easier to use and understand, as opposed to adding more complexity. I just wanted to say that randomly. This feels like redux ideas being shoehorned into React. The code itself looks so ugly to me and overly ceremonious. React lost something BIG today and prompted me to look into VueJS as the boring straightforward choice. What code examples are you comparing? I don’t see any similarity to Redux in this article but maybe I’m missing something. If anything code using Hooks looks less ceremonious to me than either of the alternatives (like render props or HOCs). That’s an interesting perspective. What parts of it look ugly specifically? This is also optional for now as you can continue working with react without using hooks. Hey Dan, thanks so much for this. It's been very interesting reading and watching the articles on the subject be posted over the past week or so. Note: Hooks are an experimental proposal to React. Do you think that people actually heed that warning? How do you suggest folks find the right balance between jumping right in to learn and experiment vs. proceeding with sufficient caution? Thank you for this article, very insightful! The topic of React Hooks was also mentioned at the most recent React Conference in Berlin. yes, my first reaction was rather visceral, i cried tears of joy. This is going to be great.